Last week I had the pleasure of being invited to dine at the Fairway Cafe & Steakhouse on the Upper West Side for a tasting. As you know, I am a huge supporter of Fairway because they carry just about everything for great prices & their products are fresh & top notch. Of course you know me, I had to take a peek at the dinner menu before I went & all the dishes sounded great and they turned out to be all that and more. I started off with some bread with olive oil and spice which tasted great! I was hungry after a long day of work. Before I continued looking at what to order they took my drink order and I opted for the Lemonade Fizz (basically a lemonade mimosa= lemonade with Prosecco) Next, the chef sent over some onion rings— they were some of the best onion rings I’ve had. They were thin & crisp and delicious. Since it was a tasting I felt it was only right that I try a soup, salad, & two entrees. I opted to try the Tuscan White Bean Soup which was great, it wasn’t too heavy on the sausage or escarole and the beans were cooked great. Next, came my favorite and why I’m determined to get Prosciutto next time I go to Fairway. 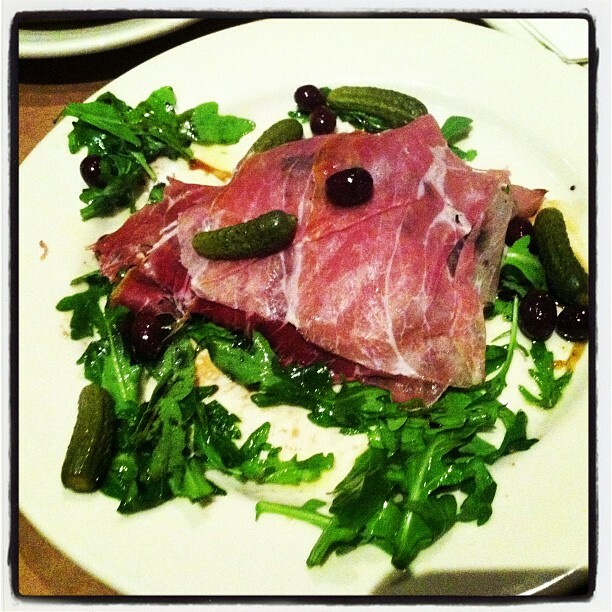 It was the Prosciutto & Baby Arugula Salad. It was one of the best salad’s I’ve ever ate and really made arugula grow on me. It had the perfect amount of thinly sliced, Italian Prosciutto, black olives, cornichons, and tons of baby arugula with an aged balsamic vinaigrette, sea salt, & EEVOO. It was a salad heaven for me & that’s coming from a girl who loves caesar salads– but I’m also a sucker for a good balsamic! 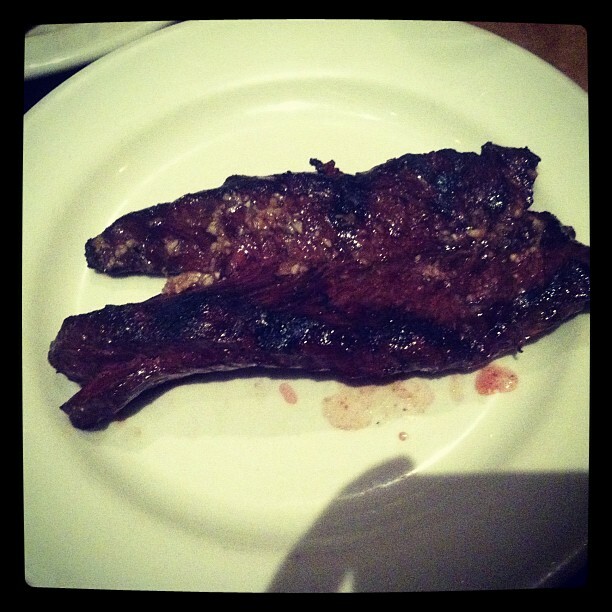 Next, came the entrees– I love seafood & a good steak. Since it is a steakhouse I opted for the hangar steak with sweet potato fries and the jumbo lump crabcakes with a corn relish. 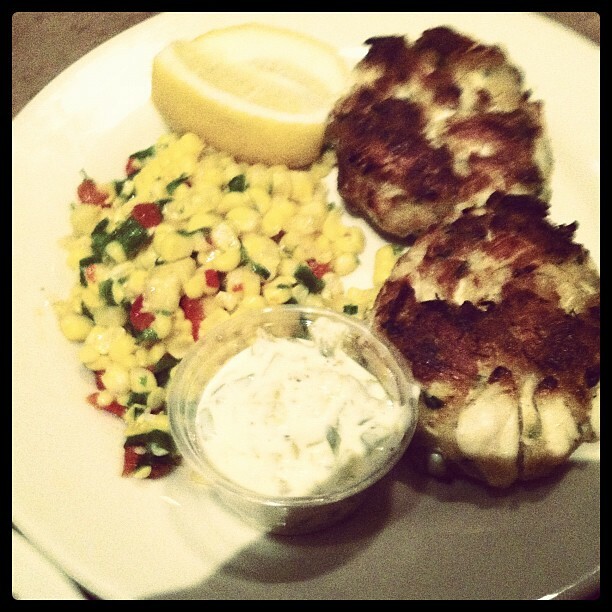 The crab cakes were a great consistency and really light and the relish really balanced it well. The steak was also great– cooked up to par, a perfect medium. Of course I had to put some Peter Luger steak sauce on it, which I actually really liked. I normally don’t put steak sauce on my steak but this was an exception. I was really impressed with both entrees. Of course, since I am a small girl, I had some steak & sweet potato fries leftover but it tasted just as great the next day which is always a plus! 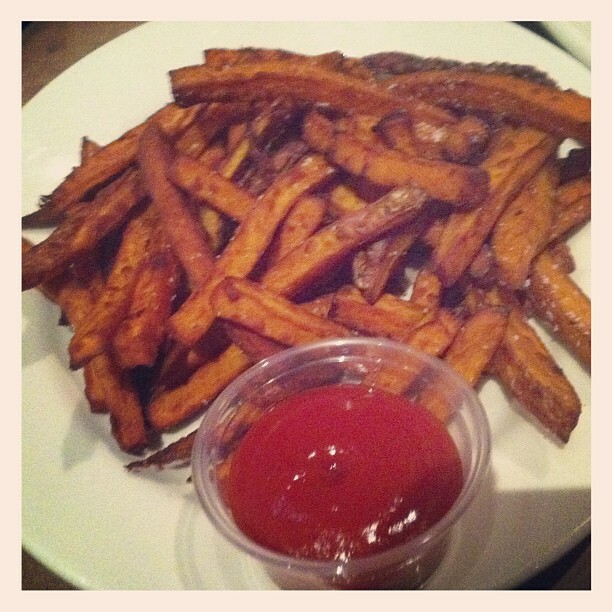 Some of the best sweet potato fries I’ve had! I was fortunate to meet the Chef Mitchel London while I was there. As Chef de Cuisine for Fairway Market, London’s philosophy is simple- “Everything must be delicious.” Before joining Fairway, Mitchel was Mayor Ed Koch’s official chef at Gracie Mansion for seven years, and for more than 20 years, he and his wife Carmela have run their own takeout shops and a catering business called Mitchel London Foods. He also owns Mitchel London’s Burgers and Cupcakes, which he opened in Manhattan in 2006– which I want to check out. He has also been featured on many food demos on NBC. London’s role includes the creation of all prepared foods and baked goods in all four locations of the gourmet supermarket. London began his career at Fairway in 1999, when he opened the popular Café and Steakhouse in the W. 74th Street store, which he still runs today. Of course I couldn’t turn down a dessert suggestion from the chef so I ended my meal by tasting the Plum Cobbler which was Chef’s special that night & the crepes a la creme. 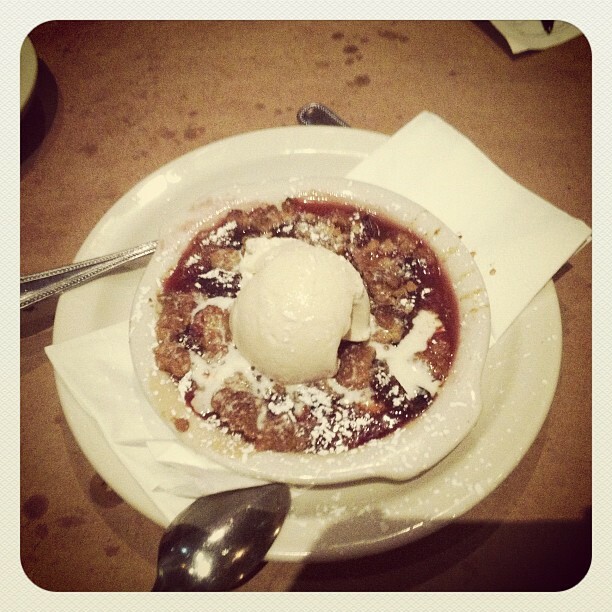 Both were amazing but the cobbler really won me over. It was a great blend of fruit fruit filling, I ate it all! 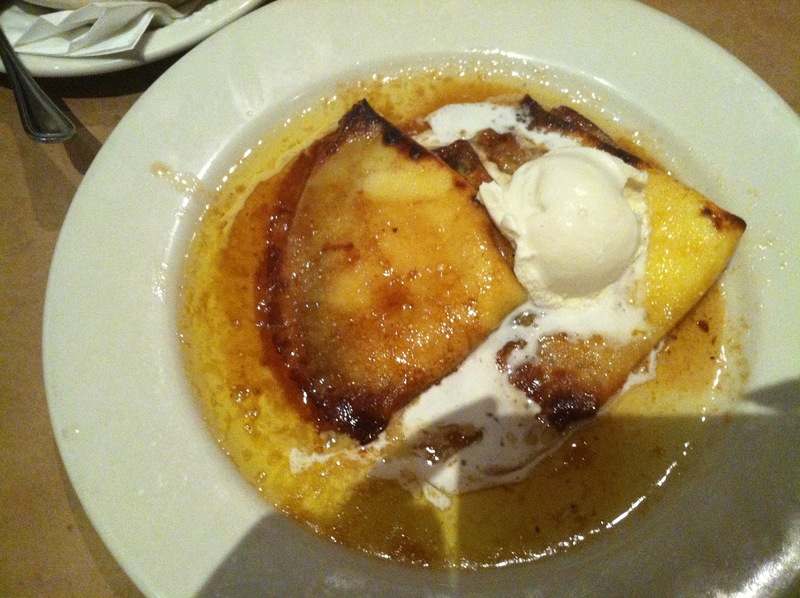 The crepes a la creme were great as well, I loved the sauce they were served with, it was an orange, vanilla flavor and light enough that it didn’t mess up the crepes. Every dish I ate was impressed by, it was not what you’d expect from a cute, cozy cafe on the 2nd floor of the Fairway. All in all the meal was a huge success. I was really happy with every dish I ate. It’s a perfect place for a date night with your boyfriend or girlfriend. They also had the Yankee game on when I was there so if they are a sports lover they won’t miss out. They also have awesome prix-fixe options, which is great for a night out and plus there is groceries downstairs. Oh and how could I forget they have happy hour, everyday from 3:00 pm – 6:00 pm, $1 off beer and wine by the glass! The staff was also friendly and helpful, ompliments to Chef London for preparing such a great meal– #SCBD will definitely be coming back! This entry was posted in cocktails, exclusive, Fairway Market, food, foodie, New York City, SCBD, Small Chick Big Deals, yummy and tagged cafe, fairway market, mitchel london, nyc, scbd, steakhouse, uws by smallchickbigdeals. Bookmark the permalink.